Are you a budding textile designer looking for new sources of inspiration? If so, you may be interested to know that a new online resource featuring 2000 images of textiles in West Yorkshire's museums has been available via VADS. 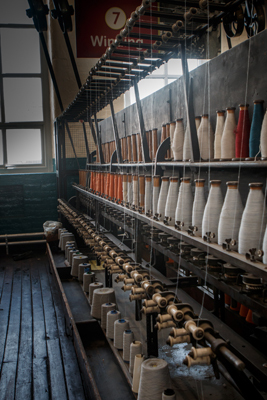 The West Yorkshire Textile Heritage Project is a partnership between Bradford, Calderdale, Kirklees and Wakefield museums. "The online database will be a superb resource for students and researchers, whilst the trail [also launched last week] will help local people find out more about our amazing local heritage. We also hope to bring new 'textile tourists' to West Yorkshire, who perhaps didn't realise just how much there is so to see and do here." The region's famous wool and worsted products are well represented, but the database also shows examples of silk, cotton and synthetic textiles for clothing fabrics, carpets, blankets, etc. These three examples show a blanket made from various types and colours of woollen cloth by Joseph Field of Skelmanthorpe in the 1860s; a 62 Vertical Bobbin Winder and a poster advertisement for Double Two ladies fashions, 1990. Check out http://www.vads.ac.uk/collections/WYTH if you'd like to see more. September 26, 2016 by Fiona Waterhouse.